Aims: The number of patients with chronic pain is increasing every year, and effective management of it is one of the prime concerns of doctors across the world. But this demands appropriate awareness, knowledge, and attitude regarding pain and specialized clinics where pain can be dealt with, using the most effective approaches. The latter vividly points at “Pain Clinics,” which form the basis of our study. Considering the Indian scenario, patients prefer visiting either their family physicians or general practitioners (GPs) to be alleviated of their pain, as they essentially believe in the suggestions of these doctors. 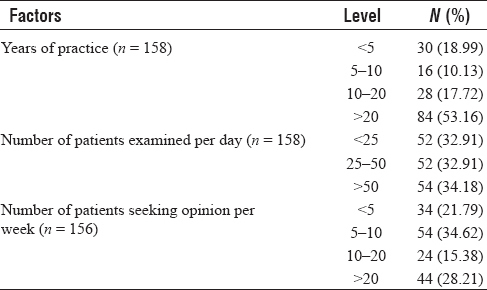 Materials and Methods: A survey of 170 GPs was conducted in Nagpur, India, to know about their knowledge, awareness, and attitude toward pain clinics through a structured questionnaire. Results: About 72% of the GPs had awareness about pain clinics, but only 32% actually referred patients to pain clinics. Sixty percent of the GPs referred patients to other specialists, mostly orthopedic surgeons. Forty percent of the GPs were aware of few techniques of pain relief; however, 65% answered negatively about techniques at pain clinics. GPs showed interest in knowing more about such clinics (88.2%). Conclusions: Majority of the GPs in Nagpur are aware of the pain clinics but are reluctant to refer patients to pain clinics. This may be due to limited knowledge about pain physicians and procedures performed at pain clinics and their efficacy and safety. “Pain” is one of the most prevalent reasons forcing people to visit a doctor. It can be classified into acute pain (i.e., short-lived pain) and chronic pain (i.e., pain that lasts for months). It includes patients with and without cancer. Chronic pain results in significant personal, societal, and economic burden., It is this chronic pain that demands specialized care; however, patients in India most commonly approach a family physician or a general practitioner (GP) for alleviation of the pain., Sometimes pain is treated by specialists such as orthopedics or neurologists who treat in different ways. In fact, such pain treatment and comprehensive pain management at pain clinics have different attributes. The concept of pain clinics was first established by Bonica in 1940 in the United States. Pain clinics emphasize on the multidisciplinary approaches with realistic goals of functional restoration while focusing on pain relief. In India, these clinics were introduced in the last few decades. Despite the benefits of an organized pain clinic in pain management, not only people but also the medical fraternity is less aware of the existence of such specialized services around them., In the present scenario, pain management largely depends on the three key factors revolving around the GPs, i.e., their “awareness, knowledge, and attitude” about pain management and pain clinics. The West has a plethora of literature focused on this subject, but documentation about Indian trends is scanty. This necessitates the evaluation of these three factors about pain clinics among GPs. Hence, it was decided to evaluate these characteristics among GPs in Nagpur, coincidentally the center of India. A descriptive cross-sectional study design was used to carry out the survey. A systemic random sampling method was used to select the registered GPs from different corners of Nagpur. Data were collected through a self-administered questionnaire. A questionnaire with 10 questions was prepared to highlight the awareness, knowledge, and attitude of the GPs about pain clinics. GPs practicing in different areas of Nagpur were approached and were requested to answer the questionnaire. The questionnaire comprised questions that were divided into three broad categories based on their types, i.e., awareness, knowledge, and attitude. Background information was gained through questions pertaining to years of practice of the GPs, number of patients examined by him/her per day, number of patients seeking his/her opinion per week for pain-related complaints, and the type of pain for which the patients visit them. The questions related to knowledge included the drugs they suggest to the patients and knowledge about a few pain-relieving techniques. The questions relating to attitude included whether the GPs refer patients to specialists, the specialists they refer patients to, and their interest in knowing more about pain clinics. Finally, the awareness-related question included whether the GPs were aware of the existence of pain clinics in Nagpur. The association between the awareness and attitude with years of practice was studied in anticipation that both increase with the practicing experience. However, the association was statistically insignificant. These were determined using χ2- test. The survey included 170 registered medical practitioners from the city who are family physicians. [Table 1] shows the number and percentage of doctors falling in each of the categories according to their personal information. Majority of the practitioners (53.16%) had more than 20 years of experience. More than half (67.08%) of the practitioners had a good patient number per day, i.e., they are attending to more than 25 patients per day and 43.5% of the GPs examine 10 or more patients of chronic pain (pain persisting for >3 months) per week. [Table 2] presents the distribution of doctors based on their awareness about and attitude toward pain clinics. It shows that if the patient is not relieved of the pain, only 70.59% of the GPs refer patients to one of the specialists: most of the time to orthopedic surgeons (62.35%) followed by neurologists (29.41%), physicians (27.06%), and surgeons (21.18%). Some GPs even referred patients to psychiatrists (10.59%). About 71.76% GPs are aware of specialized pain clinics, but only 31.76% of them refer the patients to specialized pain clinics. [Table 3] shows pain types for which patients usually approach GPs. Majority consist of joint pain (81.18%) and low-back pain (63.53%) followed by neuropathic pain (44.71%) and headaches (29.41%). Abdomen and chest pain were fairly uncommon reasons for consultation, each contributing 1.18% to the total. The table shows that the frequently prescribed medicine by the GPs for pain relief was nonsteroidal anti-inflammatory drugs (83.53%), and very few prescribed other medicines such as antidepressants (18.82%) or opioids (11.76%). Overall, 40% of the GPs were aware of peripheral nerve block, 31.76% about lumbar sympathectomy, and 25.88% about intrathecal drug delivery systems. 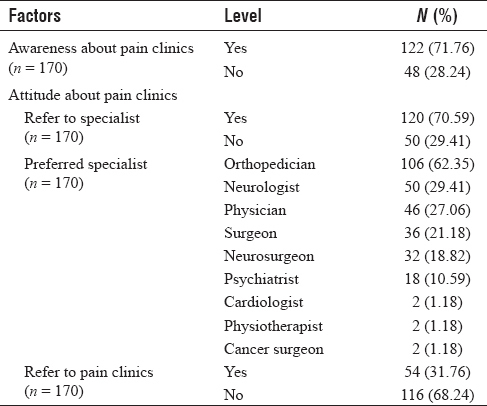 However, when asked about different techniques used at pain clinics, 65.88% answered negatively. However, majority of the GPs were interested in knowing more about pain clinics (88.24%). [Table 4] shows the association of years of practice of the GP with awareness about pain clinics. This association is statistically insignificant with the p value of 0.7938. 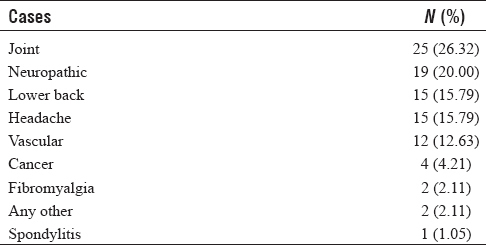 [Table 5] shows the association of years of practice of the GPs and their attitude toward pain clinics, i.e., whether they refer the patients to pain clinics or not. A statistically insignificant association was obtained between the two with the p value of 0.2967. 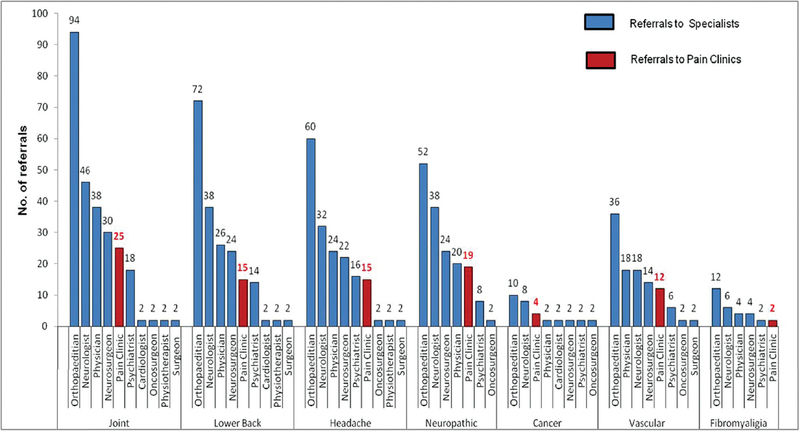 [Figure 1] shows the number of patients referred to specialists and to pain clinics according to the type of pain experienced by the patient. It is evident that in case of any pain (i.e., joint, lower back, headache, neuropathic, cancer, vascular, and fibromyalgia), for which a patient visits a GP, they are referred mainly to orthopedics followed by neurologists, physicians, neurosurgeons, and psychiatrists. At times patients are even referred to cardiologists, oncosurgeons, physiotherapists, and surgeons. But the encouraging fact is that some patients are referred to pain clinics. [Table 6] shows that the number is maximum in cases of joint pain, i.e., 25 (26.32%) followed by neuropathic pain 19 (20%), low-back pain 15 (15.79%), headache 15 (15.79%), and vascular pain 12 (12.63%). Very few patients of cancer pain, fibromyalgia, and spondylitis are referred to pain clinics. The most important finding of this study is that majority of the GPs in Nagpur are aware of the existence of specialized pain clinics. This awareness may be attributed to the initiatives taken by pain physicians who have been organizing awareness programs in the city over the past few years. This is contrary to the observation of the study in Pakistan, which shows that most of the GPs were unaware of the existence of pain clinics. In our study, majority of the GPs seem to be reluctant to refer chronic pain patients to pain clinics. This can be due to limited or vague ideas about the doctors, treatments given by them, and/or procedures performed at pain clinics and their efficacy and safety. Surprisingly, it has been observed that this attitude prevails in young as well as in old practitioners. The level of knowledge of GPs about pain clinics is independent of their age and their experience in the respective fields. It was observed that very few of them prescribed opioids for pain. A similar trend was observed in family physicians. The cited reasons for this are fear of side effects and lack of formal training in the field. A coincidental finding was that few physicians felt the treatment of chronic pain and its assessment are time-consuming and difficult in very young and elderly population. It was noticed in our study that GPs have heard about some techniques such as peripheral nerve blocks, lumbar sympathectomy, and intrathecal drug delivery system, but they did not know that such procedures form a part of the treatments in pain clinics. Our study concurs with the findings of Afshan et al. about the unawareness in GPs regarding the newer pain-relieving techniques. It was also observed that most of the GPs did not know about the role of anesthesiologists as pain physicians. A similar situation is expected to exist in India too, and further studies are required to comment on it. There are a variety of analogous studies carried out in the past, but majority of them involve nursing students and a few of them involve medical students. Also, there are many studies that refer to knowledge about cancer pains specifically. The tools used for evaluating the awareness, attitude, and knowledge also contrast in different surveys. Moreover, in most of the literature reviewed, it has been observed that the focus has remained on pain and not on pain clinics. Hence, medical professionals and the population at large need to be made aware of pain clinics, their functioning, and their efficacy such that every time the term “pain” is referred to, it is allied with “pain clinics.”. This is because pain clinics incorporate techniques and procedures focused on relieving patients from chronic pains with a holistic approach. It was also concluded in another study that doctors need to be properly educated regarding pain management to be able to deal with cancer pains. Majority of family physicians surveyed during a study felt that their official medical education did not prepare them well to efficiently manage pain. Our study was carried out in a single town in India and does not represent all the GPs in India. An attempt has to be made to carry out such studies with larger geographic coverage. This will invariably increase the sample size and give us a broader picture of the plight of the entire state or the entire country. Questionnaires need to be planned to take into consideration the additional aspects that were not tapped in this study. Our survey shows that a significant number of the GPs in Nagpur are aware of the existence of specialized pain clinics, but they lack knowledge about actual treatment procedures performed at these clinics. Hence, they seem to be reluctant to refer patients to pain clinics. Nevertheless, they want to upgrade and better their knowledge, thus emphasizing the need for regular educational programs for them. Chansoria M. Scope of pain clinics in India. J Recent Adv Pain 2017;3:59-60. Afshan G, Hussain AM, Azam SI. Knowledge about pain clinics and pain physician among general practitioners: a cross sectional survey. Pain Ther 2013;2:105-11. Dureja GP, Jain PN, Shetty N, Mandal SP, Prabhoo R, Joshi M, et al. Prevalence of chronic pain, impact on daily life, and treatment practices in India. Pain Pract 2014;14:E51-62. Loeser JD, Williams L, Wilkins. Multidisciplinary Pain Programme: Bonica's Management of Pain. 3rd ed. Philadelphia: ASA Publications; 2001. p. 255-64. Gautam S, Das G. Speciality training in pain medicine. Indian J Pain 2013;27:1-3. Singla V, Batra YK. Recognition of pain as a specialty in India. Indian J Pain 2016;30:80-2. Ponte CD, Tribino JJ. 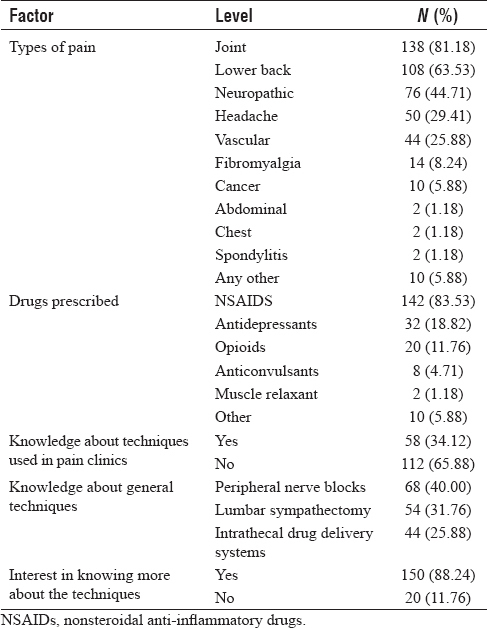 Attitudes and knowledge about pain: an assessment of West Virginia family physician. Fam Med 2005;37:477-80. Bhattacharya D, Ghosh S. Pain management in a government hospital: the present scenario. Indian J Pain 2013;27:4-6. Hashemi M, Akbari ME, Razavi SS, Niaki AS, Khameneh SM. Evaluating resident physicians' knowledge, attitude, and practice regarding the pain control in cancer patients. Iran J Cancer Prev 2015;1:1-10. Issa MR, Awajeh AM, Khraisat FS. Knowledge and attitude about pain and pain management among critical care nurses in a tertiary hospital. J Intensive Crit Care 2017;3:1-12.